This is a basic recipe for poke, a native Hawaiian dish made with diced raw fish (typically tuna) served as either an appetizer or a main course. In its purest, most mild form, the flavor of the tuna really shines through. But feel free to explore the many variations—all are fresh and delicious when they begin with Tre-Fin Day Boat Tuna. In a small bowl, combine the soy sauce, oil, honey, vinegar, and pepper flakes. In a medium bowl, combine the tuna and 2 tablespoons of the soy sauce mixture, tossing gently. Set aside 5 minutes. Arrange the rice the rice in bowls and top with the tuna mixture. Arrange the avocado, cucumber, ginger, scallions, and jalapeno around the tuna. Drizzle with the remaining soy sauce mixture, sprinkle with the sesame seeds, and serve. Combine the mayonnaise, Sriracha, vinegar, soy sauce and sesame oil. Mix to combine and refrigerate until ready to use. Slice tuna against the grain, then chop into small cubes. Place in a small bowl. Using your hands and plastic wrap, or a sushi mold, form the rice into rectangles about 2 inches long and 1 inch thick. Pack the rice as tightly as possible so that it holds together when you’re crisping it. Coat the bottom of a non-stick saute pan with vegetable oil and place over high heat. When the oil is hot enough to sizzle, fry each rice rectangle about 5 minutes per side, or until light golden brown. Remove to a paper-towel lined plate. While the rice cakes cool slightly, add 2 tablespoons of the Sriracha mayo to the tuna and toss gently to coat the pieces evenly. When the rice cakes are enough to handle, arrange them on a serving platter and spoon the tartare on top. Garnish with the scallions and sesame seeds. 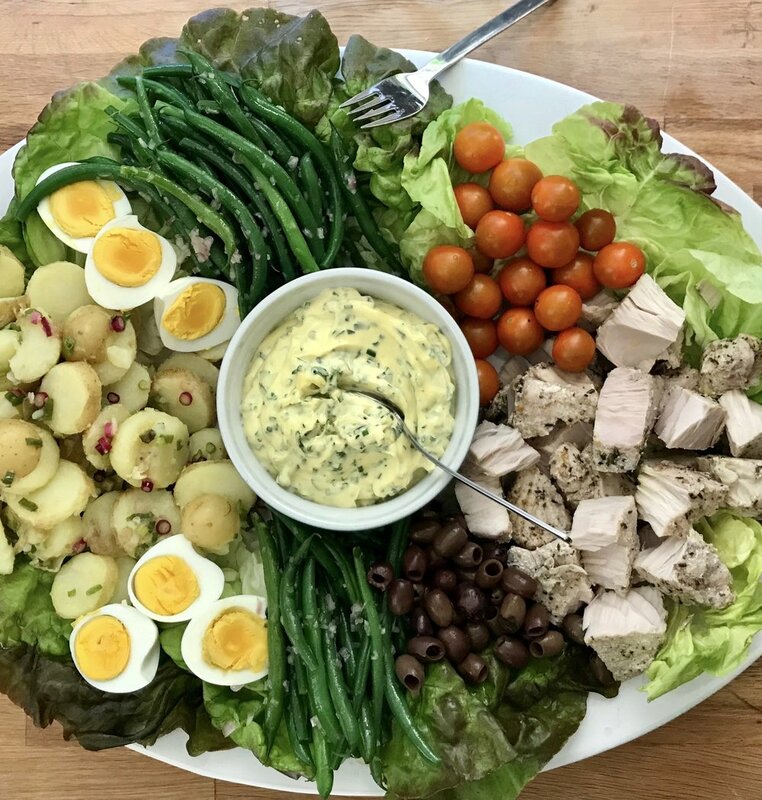 If you ask the experts from Provence, the only cooked item that should be included in an authentic salade Nicoise are the eggs. The tuna can come from a can or pouch, buy we like to poach a whole loin in olive oil with lemon, garlic and herbs. Our additions of perfectly boiled potatoes tossed with vinaigrette and blanched green beans make this version something other than the traditional preparation, but it’s delicious and we don’t care. To make the vinaigrette, whisk the vinegar with the shallot and a pinch of salt. Let sit 5 minutes before adding the mustard and drizzling the oil in in a slow steady stream while whisking. Season to taste with more salt and pepper and set aside. Cover the eggs with at least an inch of cold water. Bring the water to a vigorous boil, remove the pan from the heat and cover. Let sit 8 minutes before using a slotted spoon to transfer the eggs to a bowl of ice water. When they are cool enough to handle, peel the eggs and set aside. Return the water to a boil, salt generously and add the beans. Boil 2 minutes, lift out with tongs or a slotted spoon and quickly rinse with cold water to stop the cooking. Add the potatoes to the pan with the water, along with another pinch of salt. Return the water to a boil then reduce the heat a simmer until they are tender when pierced with a small knife, about 15 minutes. Use a slotted spoon to remove the potatoes from the pan into a bowl. When they are cool enough to handle, sliced thickly and toss with 1/3 cup of the vinaigrette and the spring or green onions. Gently combine to thoroughly coat the potatoes and set aside to cool. Meanwhile, toss the beans with 2 tablespoons of the vinaigrette in a small bowl. Halve the cherry tomatoes, add them to another small bowl and toss with 2 tablespoons of the vinaigrette. To serve, arrange the lettuce leaves around the edge of a large platter. Add the remaining ingredients in a composed fashion, or toss the potatoes, beans and tomatoes to make a bed for the tuna and olives. Garnish with the halved hard-boiled eggs. Combine the egg yolk, mustard and vinegar, whisking them for about 15 seconds, before add the olive oil in a slow, steady drizzle, while whisking continuously. When you see that the emulsification is beginning to establish (watch the side of the bowl for “ribbons” that string consistently on the edge of the bowl as you are whisking. If the ribbons become fragmented or have the appearance of more (more than egg yolk and mustard) you are adding the oil too quickly. Slow down and continue to whisk until the mixture stabilizes. Continue until all of the oil had been added. Add the lemon juice, garlic, herbs, salt and pinch of cayenne pepper to taste. Taste and adjust the acidity. Store in the refrigerator. During the cold weather months, we like to substitute vegetables in season. With this version, we break all the rules about cooking the items that accompany our tuna. Try lightly boiled potatoes or white beans, prepared much like the summer version; blanched fennel; thinly sliced white radishes and lightly steamed white carrots, along with the usual eggs, olives and herbed aioli. We’ve also been know to open a jar of pickled green beans from our pantry to add to the platter, and have enjoyed the addition of lightly steamed cauliflower florets. Andrea Bemis, who owns and operates Tumbleweed Farm with her husband Taylor, joined the Tre-Fin crew for a day on the water toward the end of the 2018 season. This recipe came out of that experience and kicked off Andrea’s Local Thirty challenge. Read more about both on her blog, Dishing Up the Dirt. Pat the tuna medallions dry with a paper towel and season with salt and pepper. Heat the butter in a large skillet over medium-high heat. Sear the tuna until a dark, golden brown crust forms, about 3 minutes. Flip the tuna and cook for about 2 minutes or just until the edges are crisp but the center is still pink. Dollop Zucchini Butter on warm tuna and serve immediately. Using a box grater or the grating attachment on a food processor, coarsely grate the zucchini. Empty the content of the bowl onto a clean dish towel and wring out as much liquid as possible. Add the butter to a deep medium-sized skillet over medium-high heat. As it begins to melt, add the garlic, thyme, and grated zucchini. Cook, stirring often, until the zucchini reaches a spreadable consistency, about 15-18 minutes. The mixture will still have plenty of texture but will be more "jam like" after cooking. If you scorch the bottom of the mixture turn the flame down but don't stress! Just stir those crispy burnt bits into the butter for added flavor! If need be add a touch of water or white wine to deglaze the pan. The zucchini will hold its bright green color and slowly caramelize into a nice vegetable jam. Slice the tuna loin into 1-inch thick pieces. Rub each medallion with a little olive oil and set aside. Place the hazelnuts, herbs, and a hefty pinch of salt into the bowl of a food processor or blender and process into a coarse meal. Be careful not to over process into hazelnut butter! Place the ground nuts on a plate and coat both sides of the tuna medallions with the mixture. Heat the ghee in a large frying pan over medium- high heat. When the ghee is hot, sear the tuna for about 2-3 minutes per side or until desired doneness. Serve immediately with Chimichurri Sauce. Place all of the ingredients in the bowl of a food processor or a large blender. Pulse to combine and chop the ingredients, then blend until smooth..
by Seth Caswell/emmer&rye, Seattle, WA, from The Chefs Collaborative Cookbook by Ellen Jackson. Photo by Gentl & Hyers. Lightly seared albacore tuna rubbed with a fragrant mixture of toasted coriander, herbs and orange zest tastes even better eaten in thick slices, with spoonfuls of the cold, mayonnaise-style egg sauce the French call Sauce Gribiche. Serve the tuna with fresh tender lettuce leaves and crusty bread for lunch, or accompanied by herbed crackers as a starter. Heat 1 tablespoon of the oil in a heavy skillet over high heat. Season the tuna pieces with salt and freshly ground black pepper and, when the pan is very hot, sear the tuna 45 seconds on each side. Immediately transfer to a plate to cool in the refrigerator. Mix the coriander, cilantro, parsley, orange zest and remaining tablespoon of oil. Rub this mixture over the cool seared tuna and marinate overnight. To serve, evenly slice each piece of tuna into 8. Arrange three slices each on 8 plates, or arrange the slices on a large platter. Dollop a spoonful of sauce gribiche on each slice of tuna and serve with herb crackers or crusty bread, or a few leaves of tender baby lettuces lightly dressed with some of the sauce gribiche. Press the egg yolks through a mesh sieve into a nonreactive bowl, or break up and mash with a fork. Add the shallots and sherry vinegar to the yolks and whisk until well combined. Slowly drizzle in the olive oil while continuing to whisk. When dressing is thickened, fold in the finely chopped egg whites, herbs, pickled fiddlehead ferns and capers and season to taste with salt and pepper. Cover and refrigerate overnight to allow the flavors to meld. There are endless variations on this simple recipe. Albacore fries up beautifully with any batter and/or coating: panko, breadcrumbs, tempura. Change up this simple beer batter in any way that you like and serve the crispy tuna slices on a bun, in a wrap or with fries, for traditional fish and chips. Dipping sauces offer another opportunity to get creative, from traditional tartar sauce to spicy aioli. If you’re short on time, use mayonnaise as your base and add Sriracha, a finely chopped chipotle and some adobo sauce, or fresh herbs and lemon zest. Partially defrost the tuna loins overnight, in the refrigerator, or let them sit out (in the packaging) on the kitchen counter for about 1 hour. 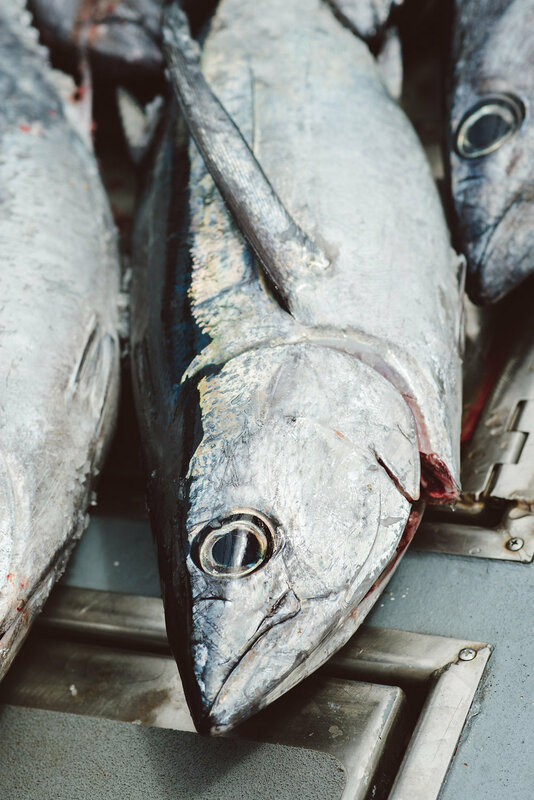 The fish should still be somewhat frozen when you slice it; albacore, like most fish, cuts more easily and cleanly when it is slightly frozen. Cut the in 1/2-inch thick slices. Arrange the slices on a plate and allow them to thaw while you prepare the batter. To fry the fish, a deep fryer is best. But since most home cooks don’t have one, a large skillet on the stovetop works just as well. Add about 1/4-inch oil to a large skillet or cast iron pan and heat it to 365 degrees F (185 deg C). If you don’t have a thermometer, you can estimate by dropping 1/2 teaspoonful of batter into the hot oil. If it sizzles on contact without smoking or browning too quickly, it’s just about right. When the temperature of the oil is right, dip the tuna pieces in the batter and turn them over to coat thoroughly. Let any excess batter drip off before carefully lowering the battered pieces into the hot oil. Let the tuna cook until the batter is deep golden brown color before flipping it over to cook on the other side. When both sides are crispy and brown, remove the pieces from the oil onto a plate lined with a paper towel to drain. This is a delicious and super-quick dinner for any weeknight, but special enough for entertaining. Serve with rice, sweet pickled sushi ginger, and baby cress, daikon sprouts or other small spicy greens. In a small bowl, stir together the soy sauce, sherry, honey and sesame oil. Divide the mixture in half and stir the rice wine vinegar into one to make the dipping sauce. Set aside. Spread the sesame seeds out on a dinner plate. Add the tuna medallions to the remaining soy sauce mixture, shake off any excess marinade and press each medallion into the sesame seeds to coat on both sides. Heat the oil in a heavy pan or cast iron skillet over high heat until very hot, just before it begins to smoke. Gently lower the sesame-coated medallions into the pan and sear on each side for approximately 30 seconds. Serve with dipping sauce and wasabi, if desired. If you are cutting medallions, you will likely have end pieces and trimmings left over. These scraps can be turned into a small batch of fresh ceviche for a future meal. Cut the loins into small pieces, approximately 1/2-inch cubes. It’s easiest to do this with a mostly frozen loin, so let the frozen loin sit on the kitchen counter 45 minutes to an hour, before you begin to cut it. Place the cubed fish in a non-reactive bowl with a tight-fitting lid. Juice enough limes that the fish is nearly covered with lime juice. (You can’t really have too much, since you’ll be draining it off later.) Add in a few healthy pinches of sea salt and big handful of coarsely chopped cilantro, and stir well to combine. Taste the fish and see what it needs. Add more seasoning as desired, cover and place in the refrigerator to marinate at least 2 to 3 hours, or up to three days. To serve, drain the excess lime juice from the fish, season to taste with additional salt and cilantro, if desired, and serve with your favorite tortilla chips. We’re fans of simple, and ceviche made with Tre-Fin Day Boat tuna doesn’t need more, but the crowd really goes wild when you add some good fresh pico de gallo to the ceviche. If you buy a good premade brand from the store, make sure to drain it well before gently folding it into your ceviche. The pico de gallo we make when we have time is simple and delicious: finely diced cucumber, tomato (seeded), onion and jalapeno with a squeeze of lime juice and a pinch of salt. Let the pico de gallo sit and marinate while the fish does, then drain both before combining. To make the ceviche, mix the albacore with the lime juice in a nonreactive bowl. Toss to combine and marinate in the refrigerator, checking every 10 minutes, until the tuna pieces are “cooked,” or slightly firmer and opaque. If you are uncertain if it is ready, cut a piece of the albacore in half; the flesh should be opaque and white on the outside, and rosy pink on the inside. Use a mesh sieve to drain the albacore removing any excess lime juice. Put fish in a bowl and add the olive oil, oregano and salt to taste. To serve, spoon the albacore over the guacamole, and serve the salsa on the side with tortilla chips, if desired. Put the zucchini in a small bowl with 1/2 teaspoon salt and toss well to insure that the salt is well distributed. Set aside for 30 minutes, after which time the zucchini will have softened. Transfer to a blender or food process fitted with a blade and blend to a smooth puree. You should have about 1/2 cup. In a small nonreactive bowl, toss the onion, chile, cilantro, and lime juice together, then remove the mixture to a cutting board and sprinkle it with the remaining salt. Chop everything until it becomes a dark green, wet paste. Mash the avocados in the bowl that contained the zucchini, add the chile paste and stir in the zucchini puree. Season to taste with additional salt as needed. This versatile dish requires some planning ahead, but the components can be prepared in advance, assembled and served warm or chilled, as either a starter or as a main course. The quality and flavor of the dish aren’t compromised when the components are made the day before serving, and the ingredients are readily available throughout the year in the Pacific Northwest. Kosher salt and white pepperSoak the konbu in cool water for 1 hour or until it is soft. Spread the konbu sheets out on a clean dry work surface and generously season both with sea salt. Arrange each half of the albacore loin on a sheet of konbu, lengthwise, and roll it up to completely encase the tuna. Place the loins on a cookie sheet or a jelly roll pan and refrigerate for at least 12 hours and up to one day. When you are ready to prepare the dish, unroll the loins and slice into bite-size pieces, approximately 16 slices per loin or 32 total. Dissolve the sea salt in 2 quarts of room temperature water. Arrange the potatoes in a pan wide enough to accommodate them in a single layer. Pour enough of the salted water over the potatoes to cover them and bring the mixture to a simmer over medium high heat. Cook until tender, then drain off all but 1/4-inch of the water and return the pan to the stove over high heat. Roll the potatoes around in the salt water until it evaporates completely and the potatoes are evenly coated in a salt crust. Remove from heat and allow to cool. Meanwhile, prepare the onions. Leaving the skin on, cut the onions in half from root to tip. Toss them with the canola oil, a generous pinch of salt and some fresh cracked white pepper and set aside for 30 minutes so that the salt can penetrate the onions. Heat the grill and char the onions on all sides until they become tender, about 7 minutes. Remove the onions from the grill and allow them to cool to room temperature. When they are cool enough to handle, peel away the charred skin and cut the onion halves in half, from root to tip. Pull them apart so that you’re left with petals. Set aside 4 petals per person. To make the sauce, place the sorrel leaves in a blender and pulse until they break down slightly. With the motor running on medium speed, slowly add the olive oil to the blender. Add a few teaspoons of water if necessary, to achieve the proper consistency, and season to taste with salt. The natural acidity of the sorrel makes the sauce vinaigrette-like. To serve, place a spoonful of the sorrel sauce in the middle of each of the plates, using the back of the spoon to spread it around in a circle that coats the plate evenly. Alternate pieces of fish with the potatoes and onion petals and serve immediately. Slice the fish into bite size blocks, 4 per person, place on the plate in alternating directions. Place the potatoes in the spaces between the fish and garnish with the onion petals. This is a basic, simple “recipe” for poke, a native Hawaiian dish made with diced raw fish (typically tuna) served as either an appetizer or a main course. In its purest, most mild form, the flavor of the tuna really shines through. But feel free to explore the many variations—all are fresh and delicious when they begin with Tre-Fin Day Boat Tuna. Remove the fish from the freezer and leave it out on the counter (still in its package) for 30 to 60 minutes. You want the fish to soften slightly, but remain mostly frozen as it will cut more easily this way. After you remove the loin from the package, find the skin side. It will have noticeable lines on it that are easily shaved off with a sharp knife if the loin is slightly softened, but still frozen. This step isn’t necessary for a recipe that requires cooking, but is worth doing for poke as it makes a difference in the final appearance. Slice the loin into medallions, or cross sections, 1/4 to 1/2-inch thick. Cut each medallion into cubes. The size of the cubes is a personal preference; larger chunks have more texture and accentuate the fish, but if you’re feeding a less adventurous crowd, smaller pieces will probably go over better. Place the cubed fish, which is still mostly frozen, in a large mixing bowl. Working with the cubed fish while it is frozen means the pieces hold together better while adding the other ingredients and mixing. Add a generous amount of sesame oil and use your hands to toss the fish, lightly and evenly covering the pieces. You want a good coating on all of the fish, which will help preserve its natural color as it is exposed to oxygen, and allow the other ingredients to adhere. Add sea salt, coarsely ground black pepper, garlic powder, thinly sliced green onions, red pepper flakes and sesame seeds. Toss the fish to mix and taste. Continue adding more of each seasoning until it tastes like you want it to—you really can’t go wrong! That said, proceed with caution and a light hand when adding the red pepper flakes so you don’t end up with something that’s too spicy for your crowd. For a meal, serve the poke over rice after drizzling it with soy sauce. To serve it as an appetizer, add rice crackers for dipping. You can also wrap the poke into a sushi roll or in a spring roll wrapper with white rice. There are more than you can imagine! Lots of recipes call for adding soy sauce or Ponzu directly to the fish, which tastes great, but tends to discolor the fish. You can skip that step by adding the soy sauce to the rice instead. Avocado is a delicious addition, thinly sliced radish adds crunch, and seaweed salad is a nice complement, texturally and thematically! Simple enough for a weeknight meal, or perfect for inclusion in your Christmas celebration of the Feast of the Seven Fishes. Good tuna and tomatoes like San Marzano make the difference! Fill a large pot with water and a generous amount of salt. Bring to a boil. Meanwhile, drain any liquid from the tuna into a large, wide saute pan. Add the olive oil, anchovy, capers and smashed garlic cloves and warm over medium low heat until the garlic is golden, about 4 minutes. Add the onion and saute until transparent, about 4 minutes. Add the red pepper flakes and tomatoes, increase the heat to medium high and continue to cook until the mixture boils. Reduce the heat to a simmer and cook gently until the sauce is fairly thick. Season to taste with salt, black and cayenne pepper. Add 1/4 cup of the parsley and the tuna in chunks. Stir the tuna in, breaking the chunks up slightly. Reduce heat to medium low and continue to simmer about 10 minutes, while the pasta is cooking. Add the pasta to the boiling water and cook according the the instructions on the package. When it is al dente, scoop out a cup of the pasta water and set it aside. Drain the pasta and add it to the pan with the sauce. Heat over medium high heat, adding some of the pasta water until the sauce is your desired consistency. Add the remaining parsley, toss to combine and serve immediately with the Parmigiano-Reggiano cheese. Remove the fish from the freezer and leave it out on the counter (still in its package) for 30 to 45 minutes. You want the fish to soften slightly, but remain mostly frozen as it will cut more easily this way. After you remove the loin from the package, find the skin side. It will have noticeable lines on it that are easily shaved off with a sharp knife if the loin is slightly softened, but still frozen. This step isn’t necessary for a recipe that requires cooking, but makes a difference in the final appearance of this preparation and poke. Slice the loin as thinly as possible. Arrange the slices on a large platter, slightly overlapping them, to cover the surface of the plate. Generously scatter the albacore slices with red onion, green onion, jalapeno, cilantro, sesame seeds and coarse sea salt. Serve immediately, with soy sauce or a combination of soy sauce and ponzu, and wasabi if desired. Tuna and chickpeas simmered together over low heat in a delicious soupy broth of chicken stock and rosemary and garlic-infused olive oil make an unbeatable combination. Nutty creamy chickpeas and moist, barely pink tuna, with a hint of bitterness from the radicchio, become the perfect dinner with salad and bread for sopping up the flavorful braising liquid. Or serve at room temperature, on a bed of greens for lunch. Or include on an antipasto platter. However you enjoy it, finish the dish with a generous drizzle of good olive oil, a squeeze of lemon juice and sprinkle of coarse sea salt. Remove the tuna loin(s) from the freezer 30 to 45 minutes before you begin to prepare the recipe. Allow it to defrost on the counter before cutting into 1-1/4 inch medallions. Place medallions in a single layer on a plate and store in the refrigerator until ready to use. Combine the olive oil, garlic, rosemary and pepper flakes in a 10 to 12-inch skillet with high sides and a fitted lid. Heat over lowest possible heat, covered, until the garlic becomes fragrant, soft and lightly golden, about 3 minutes. Check frequently that the garlic isn’t frying or browning in the oil. Set aside. Cut the radicchio in half and use a paring knife to remove the core. Place the halves cut side down and slice into 1/2-inch thick ribbons. Add the shredded radicchio to the pan, increase the heat to medium and saute, stirring occasionally, until the radicchio is wilted, about 5 minutes. Add the stock, lemon juice, chickpeas and a generous pinch of salt to the pan. Bring to a simmer, cover and let cook gently for 8 to 10 minutes, to allow the flavors to develop. Season the tuna on both sides with salt and pepper, and set on top of the chickpeas and radicchio. Reduce the heat to low, cover and braise gently, checking every once in a while to make certain the liquid is simmering gently, not boiling. After 6 to 8 minutes the medallions should be cooked about halfway through. This will be apparent as the top half will still be pink, and the cooked portion sitting in the simmering liquid, chickpeas and radicchio will be opaque and white-ish, about halfway up the medallions. Slide a slotted spatula under the medallions and turn them, allowing the ingredients from below to cover them. After they’ve all been turned, the medallions should be smothered with the chickpeas and radicchio. Replace the lid and continue to braise gently until the medallions are cooked through, another 4 to 6 minutes. They’re at their best and most moist with there’s a trace of pink in the center of the medallion. To serve, place a medallion or two each in warm shallow pasta bowls. Stir the parsley into the pan, season to taste with additional salt and pepper and spoon the soupy chickpeas and radicchio, and plenty of broth, over the tuna pieces. Drizzle with some good olive oil, squeeze some lemon over top and finish with a pinch of coarse sea salt.